SCVHistory.com | Government | Santa Clarita Valley Organized Into Tejon Township, 8-14-1855. Santa Clarita Valley Organized Into Tejon Township. Los Angeles County Board of Supervisors | August 14, 1855. Just one week after Surveyor-General Edward F. Beale acquired the first piece (Rancho La Liebre) of his eventual 300,000-acre Rancho El Tejon, the Los Angeles County Board of Supervisors organized the Santa Clarita Valley — from the San Fernando (later called Newhall) Pass on the south to the county line on the north — into the Tejon Township, a political jurisdition for electoral and other government purposes (Census, judiciary). The date was Aug. 14, 1855. Note that the county line on the north was the border with Tulare County, there being no Kern County until 1866. Kern was formed out of the southern part of Tulare County, with cessions from Los Angeles and San Bernardino counties — so the 1855 border was farther north than the present L.A.-Kern County line. Fort Tejon (1854-1864) and the Sinks of Tejon were in Los Angeles County. We're not certain when the Tejon Township became the Soledad Township (with altered boundaries), but it was probably 1873 when the Soledad Judicial District was formed. SESSION OF AUGUST 14th, 1855. Ordered, that a new and additional election precincts be, and the same are hereby established in the following places, to wit: One at the Mission of San Fernando; one at the Ranch of La Bayona; one at Fort Tejon district, hereby constituted a Township, to be known as Tejon Township, which shall include all that part of Los Angeles county on the North-East and North-West side of the range of mountains North of the ranch of San Fernando, or San Francisquito, and beyond Turner’s Pass, to the boundary line of this county, on the North and West to the line of Tulare County, and also the Ranch called Casteque in said district. 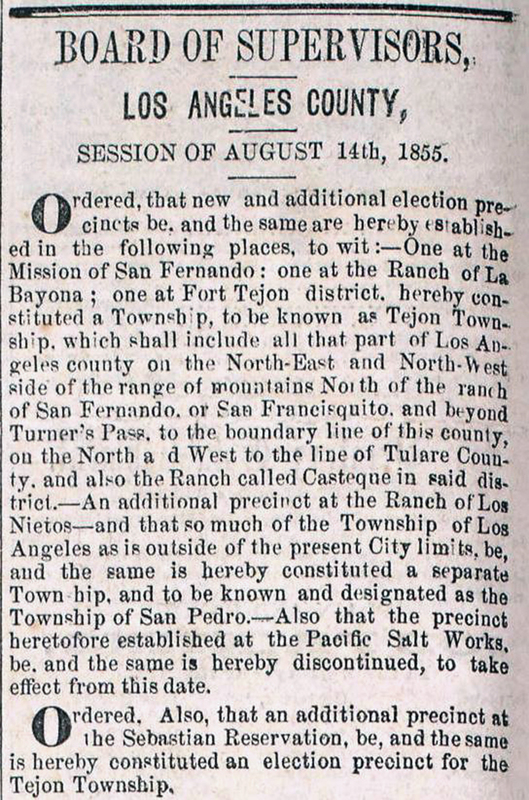 An additional precinct at the Ranch of Los Nietos — and that so much of the Township of Los Angeles as is outside of the present City limits, be, and the same is hereby constituted a separate Township, and to be known and designated as the Township of San Pedro. Also that the precinct heretofore established at the Pacific Salt Works, be, and the same is hereby discontinued, to take effect from this date. Ordered. Also, that an additional precinct at the Sebastian Reservation, be, and the same is hereby constituted an election precinct for the Tejon Township.